Drawings by Renaissance master Leonardo da Vinci are now on display at the Walker Art Gallery as part of a UK-wide free exhibition. 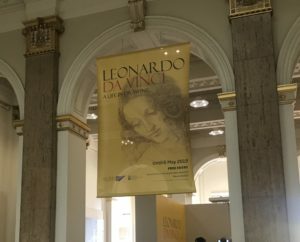 ‘Leonardo Da Vinci: A Life in Drawing’ was launched on Friday at the Walker Art Gallery and will continue through to May 6th. The exhibition of 12 pieces is aiming to commemorate the 500th anniversary of the artist’s death. Liverpool is one of a dozen venues that is hosting the celebration which has been organised by Royal Collection Trust. The displays focus on da Vinci’s the diversity of subjects that inspired his creativity, including painting, sculpture, architecture and music. Examples of all the drawing materials employed by the Italian genius are displayed in Liverpool and beyond, including pen and ink, red and black chalks, watercolour and metal point. Xanthe Brooke, Curator of European Art, National Museums Liverpool, said: “Leonardo da Vinci is undoubtedly one of the most renowned and influential artists in history, having left a major impact within the disciples of both art and science. “We’re honoured to be part of this wonderful showcase of drawings, creating a very special moment in the Walker’s history. Following this array of 12 UK exhibitions, the art will be brought together in May 2019 for a collective display in The Queen’s Gallery, Buckingham Palace. This event will showcase over 200 sheets of the artist’s work, making it what organisers claim is the largest exhibition of Leonardo’s work in over 65 years.